Income varies considerably, from near the national median to well in excess of US$100,000. However, household income figures do not always reflect class status and standard of living as they are largely influenced by the number of income earners and fail to recognize household size. It is therefore possible for a large, dual-earner, lower middle class household to out-earn a small, one-earner, upper middle class household. The middle classes are very influential as they encompass the majority of voters, writers, teachers, journalists and editors. Most societal trends in the U.S. originate within the middle classes. Well, it depends on whom you ask. Everyone wants to believe they are middle class. For people on the bottom and the top of the wage scale the phrase connotes a certain Regular Joe cachet. But this eagerness to be part of the group has led the definition to be stretched like a bungee cord - used to defend/attack/describe everything from the Earned Income Tax Credit to the estate tax. The "professional class", also called the "upper middle class," consists mostly of highly educated white collar salaried professionals, whose work is largely self-directed. In 2005, these household incomes commonly exceed $100,000 per year. Class members typically hold graduate degrees, with educational attainment serving as the main distinguishing feature of this class. —  Dennis Gilbert, The American Class Structure, 1998. As 42% of all households, and the majority of those in the top 40%, had two income earners, household income figures would be significantly higher, ranging from roughly $50,000 to $100,000 in 2005. In terms of educational attainment, 27% of persons had a Bachelor's degree or higher. Factors such as nature of work and lack of influence within their jobs leads some theorists to the conclusion that most Americans are working class. They have data that shows the majority of workers are not paid to share their ideas. These workers are closely supervised and do not enjoy independence in their jobs. Also, they are not paid to think. For example: The median annual earnings of salaried dentists were $136,960 in May 2006, indicating a high degree of scarcity for qualified personnel. The opinions and thoughts of dentists, much like those of other professionals, are sought after by their organizations and clients. The dentist creates a diagnosis, consults the patient, and conceptualizes a treatment. In 2009, Dental assistants made roughly $14.40 an hour, about $32,000 annually. Unlike dentists, dental assistants do not have much influence over the treatment of patients. They carry out routine procedures and follow the dentists' instructions. Here we see that a dental assistant being classified as working class. Similar relationships can be observed in other occupations. Some modern theories of political economy consider a large middle class to be a beneficial and stabilizing influence on society because it has neither the possibly explosive revolutionary tendencies of the lower class, nor the absolutist tendencies of an entrenched upper class. Most sociological definitions of middle class follow Max Weber. Here, the middle class is defined as consisting of professionals or business owners who share a culture of domesticity and sub-urbanity and a level of relative security against social crisis in the form of socially desired skill or wealth. Thus, the theory on the middle class by Weber can be cited as one that supports the notion of the middle class being composed of a quasi-elite of professionals and managers, who are largely immune to economic downturns and trends such as out-sourcing which affect the statistical middle class. Many social scientists including economist Michael Zweig and sociologist Dennis Gilbert contend that middle class persons usually have above median incomes. As social classes lack clear boundaries and overlap there are no definite income thresholds as for what is considered middle class. In 2004, sociologist Leonard Beeghley identifies a male making $57,000 and a female making $40,000 with a combined households income of $97,000 as a typical middle-class family. In 2005, sociologists William Thompson and Joseph Hickey estimate an income range of roughly $35,000 to $75,000 for the lower middle class and $100,000 or more for the upper middle class. Income is one of a household's attributes most commonly used to determine its class status. Yet, income may not always accurately reflect a household's position within society or the economy. Unlike personal income, household income does not reflect occupational achievement as much as it measures the number of income earners. Sociologist Dennis Gilbert acknowledges that a working-class household with two income earners may out-earn a single-income upper-middle-class household, as the number of income earners has evolved into one of the most important variables in determining household income. For example, according to the US Department of Labor, two registered nurses could quite easily command a household income of $126,000 in 2006, while the median income for a lawyer was $94,930. Changes as to inequality and poverty have not always been in the same direction. Poverty rates increased early in the 1980s until late in the 1990s when they started to go back down. Since 2000, the percent of all people living in poverty has risen from 11.3% to 15.1% in 2010.This statistical measure of the poverty rate takes into account only a household's current year's income, while ignoring the actual net worth of the household. 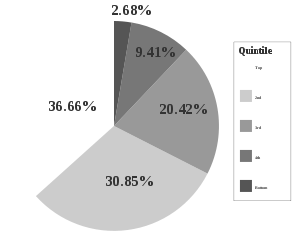 In 2006 households that earn between $25,000 and $75,000 represent approximately the middle half of the income distribution tables provided by the U.S. Census Bureau. Over the past two decades, the number of households in those brackets decreased by 3.9%, from 48.2% to 44.3%. During the same time period, the number of households with incomes below $25,000 decreased 3.5%, from 28.7% to 25.2%, while the number of households with incomes above $75,000 increased over 7%, from 23.2% to 30.4%. A possible explanation for the increase in the higher earnings categories is that more households now have two wage earners. However, a closer analysis reveals all of the 7% increase can be found in households who earn over $100,000. Five years after the official end of the Great Recession, corporate profits are high, and the stock markets are booming. Yet most Americans are not sharing in the recovery. While the top 0.1% of income recipients – which include most of the highest-ranking corporate executives – reap almost all the income gains, good jobs keep disappearing, and new employment opportunities tend to be insecure and underpaid. ^ "Politics and Economy: Who Is the Middle Class?". June 25, 2004. Retrieved July 25, 2006. (citing Drum Major Institute for Public Policy). ^ Dante Chinni (May 10, 2005). "One more social security quibble: Who is Middle Class?". Christian Science Monitor. Retrieved September 11, 2006. ^ a b c d e Williams, Brian; Stacey C. Sawyer; Carl M. Wahlstrom (2005). Marriages, Families & Intimate Relationships. Boston, MA: Pearson. ISBN 0-205-36674-0. ^ a b c d e Gilbert, Dennis (1998). The American Class Structure. New York: Wadsworth Publishing. ISBN 0-534-50520-1. ^ John B. Judis (July 11, 2003). "The trouble with Howard Dean". Salon.com. Archived from the original on July 13, 2007. Retrieved July 19, 2007. ^ John Steele Gordon Archived April 20, 2008, at the Wayback Machine "10 Moments That Made American Business", American Heritage, February/March 2007. ^ a b c d e f g h Ehrenreich, Barbara (1989). Fear of Falling, The Inner Life of the Middle Class. New York, NY: Harper Collins. ISBN 0-06-097333-1. ^ a b Beth Potier (October 30, 2003). "Middle income can't buy Middle class lifestyle". Harvard Gazette. Archived from the original on June 23, 2006. Retrieved July 25, 2006. ^ a b Griff Witte (September 20, 2004). "As Income Gap Widens, Uncertainty Spreads". The Washington Post. Retrieved July 25, 2006. ^ a b c d Eichar, Douglas (1989). Occupation and Class Consciousness in America. Westport, Connecticut: Greenwood Press. ISBN 0-313-26111-3. ^ a b c "US Census Bureau, personal income by education". Archived from the original on October 9, 2006. Retrieved October 17, 2006. ^ a b c "U.S. Census 2005 Economic Survey, income data". Archived from the original on June 30, 2006. Retrieved June 29, 2006. ^ a b c d Gilbert, Dennis (1997). American Class Structure in an Age of Growing Inequality. Wadsworth. ISBN 978-0-534-50520-2. ^ "Education resource information center, Effects of Social Class and Interactive Setting on Maternal Speech". Retrieved January 27, 2007. ^ Zweig, Michael (2004). What's Class Got To Do With It, American Society in the Twenty-First Century. New York, NY: Cornell University Press. ISBN 0-8014-8899-0. ^ "CNN exit poll, 2006". Archived from the original on June 29, 2007. Retrieved June 14, 2007. ^ "CNN exit poll, 2004". Archived from the original on May 14, 2007. Retrieved June 14, 2007. ^ "U.S. Census Bureau, distribution of personal income, 2006". Archived from the original on December 14, 2006. Retrieved December 9, 2006. ^ a b Vanneman, Reeve; Lynn Weber Cannon (1988). The American Perception of Class. New York, NY: Temple University Press. ISBN 0-87722-593-1. ^ a b c Levine, Rhonda (1998). Social Class and Stratification. Lanham, MD: Rowman & Littlefield. ISBN 0-8476-8543-8. ^ "Income and nature of work of dentists". Archived from the original on September 23, 2006. Retrieved September 13, 2006. ^ "Income and nature of work of dental assistants". Archived from the original on January 5, 2009. Retrieved January 12, 2009. ^ Beeghley, Leonard (2004). The Structure of Social Stratification in the United States. New York, NY: Pearson. ISBN 0-205-37558-8. ^ "Household income according to the educational attainment of householder". Archived from the original on July 10, 2009. Retrieved September 16, 2006. ^ "US Department of Labor, registered nurses". Archived from the original on October 20, 2006. Retrieved October 25, 2006. ^ "US Department of Labor, Median income of lawyers". Archived from the original on October 30, 2006. Retrieved October 25, 2006. ^ Fussel, Paul (1983). Class, A Guide through the American status system. New York, NY: Touchstone. ISBN 0-671-79225-3. ^ a b "Professional Occupations according to the US Department of Labor". Archived from the original on July 21, 2006. Retrieved July 26, 2006. ^ "New York Times, guidelines for determining class in America". New York Times. Retrieved July 28, 2006. ^ "Realty Times, the increasing size of American homes". Archived from the original on June 21, 2006. Retrieved July 26, 2006. ^ "Nickel and Damned: Barbara Ehrenreich's View of America". July 1, 2002. ^ "The Manufacturing Practices of Nike and its competitors". ^ a b c "Income, Poverty, and Health Insurance Coverage in the United States: 2006" (PDF). Retrieved November 24, 2007. ^ a b c "Aron-Dine, A. & Sherman, A. (January 23, 2007). New CBO Data Show Income Inequality Continues to Widen: After-tax-income for Top 1 Percent Rose by $146,000 in 2004". Archived from the original on December 24, 2007. Retrieved November 24, 2007. ^ "Johnston, D. (5 June 2005). Richest Are Leaving Even the Richest Far Behind. The New York Times". Archived from the original on July 14, 2007. Retrieved June 20, 2007. ^ a b "Janet Yellen(6 November 2006). Speech to the Center for the Study of Democracy at the University of California, Irvine. Federal Reserve Bank of San Francisco". Retrieved June 20, 2007. ^ "Johnston, D. (29 March 2007). Income Gap Is Widening, Data Shows. The New York Times". March 29, 2007. Retrieved June 20, 2007. ^ Saez, E. & Piketty, T. (2003). Income inequality in the United States: 1913–1998. Quarterly Journal of Economics, 118(1), 1–39. ^ "Saez, E. (October, 2007). Table A1: Top fractiles income shares (excluding capital gains) in the U.S., 1913–2005". Retrieved January 17, 2008. ^ Weeks, J. (2007). Inequality Trends in Some Developed OECD countries. In J. K. S. & J. Baudot (Ed. ), Flat World, Big Gaps (159–174). New York: ZED Books (published in association with the United Nations). ^ Bernstein, Aaron (February 26, 1996). "Is America Becoming More of a Class Society?". BusinessWeek. ^ "Where Did They Go? the Decline of Middle-Income Neighborhoods in Metropolitan America". Archived from the original on November 21, 2007. Retrieved November 24, 2007. ^ Reynolds, Alan. Income and Wealth. Westport, CT: Greenwood, 2006. 73-108. Print. ^ Alan J. Auerbach, "Who Bears the Corporate Tax?" NBER Working Paper 11686 (October 2005), p. 4. ^ Congressional Budget Office, Tax-Deferred Retirement Savings in Long-Term Revenue Projections (May 2004), p. 8. [www.cbo.gov]. ^ Department of Treasury. "Income Mobility in the U.S. from 1996 to 2005". November 13, 2007. Web. <[www.treasury.gov]> Archived May 5, 2012, at the Wayback Machine. ^ William Laconic, Profits without Prosperity. In: Harvard Business Review (November 10, 2015). HBR's 10 Must Reads 2016: The Definitive Management Ideas of the Year from Harvard Business Review. Harvard Business Review Press. p. 13. ISBN 978-1-63369-081-3. Quart, Alissa (2018). Squeezed: Why Our Families Can't Afford America. Ecco Press. ISBN 978-0062412256. Temin, Peter (2017). The Vanishing Middle Class: Prejudice and Power in a Dual Economy. MIT Press. ISBN 9780262036160.